On the night of June 4, 1895, a message arrived in Lowell, Massachusetts for 75-year-old Peter Fitzpatrick, informing him his 30-year-old son, Philip H. Fitzpatrick, was dead in Savannah, Georgia. Peter instructed authorities to send his son’s body home to Lowell, however, Savannah replied, no way. In a haze of grief, the elderly Fitzpatrick began packing a bag for the thousand-mile trip south. The dreadful news spread across the familial network of Fitzpatricks, Rileys and Donahoes, and, perhaps, his sister Bridget Donahoe, realized Peter should not undertake the journey alone. Frank J. Donahoe stepped up to accompany his uncle. From the downtown depot, the men took the train to Boston. They may have gone on to New York by rail, in order to board the first steamship bound south. On arrival in Savannah, Peter and Frank had their grief compounded, as they learned Philip Fitzpatrick’s remains had already been buried in the interest of public health, and exhuming the body was forbidden. the men were certainly shown to Savannah’s Catholic cemetery on Wheaton Street. There, they said their goodbyes and offered prayers over a mound of freshly-turned earth. Their mission a failure, the bereaved father and cousin left for home. THE DROWNING OF FRANK J. DONAHOE. A GREAT WAVE SWEPT HIM OFF THE STEAMER’S DECK. There was a High Wind and a Heavy Sea–his Hat blew off, and he Reached for it Just as the Big Wave swept over the steamer. Last night a dispatch was received from the agent of the steamer on which Frank J. Donahoe and his uncle, Peter Fitzpatrick, sailed from Savannah for New York. It stated that a man named Frank Donahoe was lost overboard from the steamer. Peter Fitzpatrick arrived in Lowell on the nine o’clock train this morning and full particulars of the sad affair were made known. Mr. Fitzpatrick is looking well after his rough voyage, but he is terribly agitated at the sudden taking of his nephew. The steamer is supposed to be the Algonqula of the Clyde line, Capt. Pratt in command, but Mr. Fitzpatrick is not sure of this. The steamer had a very rough voyage, the passage being unusually severe, the captain informed Mr. Fitzpatrick and his nephew [who] were standing on deck. The sea was very rough. A gale of wind blew Frank Donahoe’s hat from his head at about 11 o’clock. He attempted to catch it before it fell overboard. It was a fatal attempt. A great wave swept across the deck and he was carried into the ocean. No help could be given him. For the heartbroken Peter Fitzpatrick, there were two deaths, two bodies he could not bring home, yet the resilient old man lived 85 years. What of his nephew whose fate decreed he’d get just half that time on Earth? Having focused on his grocery business and democratic politics, Frank didn’t marry until 1889, when he was 37 and well enough established to support a family. His bride was  22-year-old, Mary A. Donahoe (likely, a distant cousin). I can’t know for sure, but I’m willing to bet Frank wore a bowler, also called a derby. It was the most popular hat worn by men in America in the 19th century, including Billy the Kid and Butch Cassidy. Lowell had at least one store dedicated to male fashion in the 1890s, “Wm. P. Brazer & Co. Hatters & Mens Outfitters,” at Central & Market streets, advertised in the city directory. In his personal life, the the family he hoped for never happened. The reason may have been Mary’s health. She died of tuberculosis in April 1894, leaving Frank alone. Two months after Mary died, Frank’s younger brother Patrick followed her to the grave. How Frank handled these tragedies is unclear. He left the grocery business at some point after 1889. The Lowell directory for 1895 lists Frank living on Keene Street with his widowed mother. His occupation was – janitor. Frank wouldn’t have been the first man to fall apart on losing his life’s partner. Maybe he fell apart before the end. “Consumption” (tuberculosis) is a cruel wasting disease, and we don’t know how long Mary was sick and Frank surely suffered along with her. If he tended her during a protracted illness, he may have been unable to keep up with the demands of a grocery store. He may have sold out or lost the business. It’s possible Frank took to drink to ease the pain. When the news of Philip’s death arrived in Lowell, it had been a year since his wife Mary and his brother Patrick died. Having so long felt powerless to help the people he loved, Frank rallied. Proven articulate and persuasive in city politics, he could assist his uncle with officials in Savannah. He could be of use to his loved ones. Frank may have dressed hurriedly to make the train, but he took care to make a good appearance, from the shine on his shoes, to the finely made hat on his head. “Massachusetts Births, 1841-1915”, database with images, FamilySearch (https://familysearch.org/ark:/61903/1:1:FXC4-NTL : 1 March 2016), Francis Donahue, 1852. H.A. Thomas & Wylie. 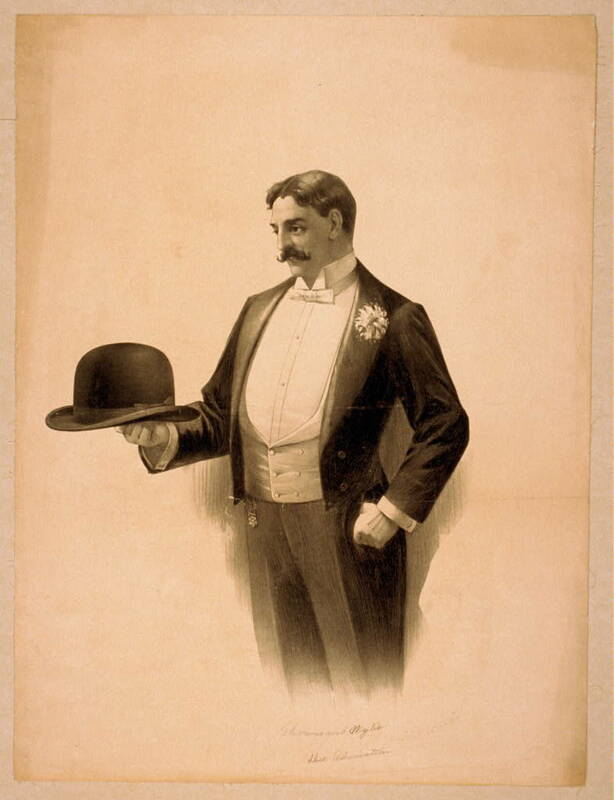 Man Wearing Tuxedo, Holding Bowler Hat. , ca. 1896. [N.Y.: H.A. Thomas & Wylie Litho. Co] Photograph. https://www.loc.gov/item/2014636873/.